Among the Greeks and Romans of the classical age philosophy occupied the place taken by religion among ourselves. Their appeal was to reason not to revelation. To what, asks Cicero in his Offices, are we to look for training in virtue, if not to philosophy? Now, if truth is believed to rest upon authority it is natural that it should be impressed upon the mind from the earliest age, since the essential thing is that it should be believed, but a truth which makes its appeal to reason must be content to wait till reason is developed. We are born into the Eastern, Western or Anglican communion or some other denomination, but it was of his own free choice that the serious minded young Greek or Roman embraced the tenets of one of the great sects which divided the world of philosophy. The motive which led him to do so in the first instance may have been merely the influence of a friend or a discourse from some eloquent speaker, but the choice once made was his own choice, and he adhered to it as such. Conversions from one sect to another were of quite rare occurrence. A certain Dionysius of Heraclea, who went over from the Stoics to the Cyrenaics, was ever afterward known as "the deserter." It was as difficult to be independent in philosophy as it is with us to be independent in politics. When a young man joined a school, he committed himself to all its opinions, not only as to the end of life, which was the main point of division, but as to all questions on all subjects. The Stoic did not differ merely in his ethics from the Epicurean; he differed also in his theology and his physics and his metaphysics. Aristotle, as Shakespeare knew, thought young men "unfit to hear moral philosophy". And yet it was a question—or rather the question—of moral philosophy, the answer to which decided the young man's opinions on all other points. The language which Cicero sometimes uses about the seriousness of the choice made in early life and how a young man gets entrammelled by a school before he is really able to judge, reminds us of what we hear said nowadays about the danger of a young man's taking orders before his opinions are formed. To this it was replied that a young man only exercised the right of private judgment in selecting the authority whom he should follow, and, having once done that, trusted to him for all the rest. With the analogue of this contention also we are familiar in modern times. Cicero allows that there would be something in it, if the selection of the true philosopher did not above all things require the philosophic mind. But in those days it was probably the case, as it is now, that, if a man did not form speculative opinions in youth, the pressure of affairs would not leave him leisure to do so later.The life span of Zeno, the founder of Stoicism, was from B.C. 347 to 275. He did not begin teaching till 315, at the mature age of forty. Aristotle had passed away in 322, and with him closed the great constructive era of Greek thought. The Ionian philosophers had speculated on the physical constitution of the universe, the Pythagoreans on the mystical properties of numbers; Heraclitus had propounded his philosophy of fire, Democritus and Leucippus had struck out a rude form of the atomic theory, Socrates had raised questions relating to man, Plato had discussed them with all the freedom of the dialogue, while Aristotle had systematically worked them out. The later schools did not add much to the body of philosophy. What they did was to emphasize different sides of the doctrine of their predecessors and to drive views to their logical consequences. The great lesson of Greek philosophy is that it is worth while to do right irrespective of reward and punishment and regardless of the shortness of life. This lesson the Stoics so enforced by the earnestness of their lives and the influence of their moral teaching that it has become associated more particularly with them. Cicero, though he always classed himself as an Academic, exclaims in one place that he is afraid the Stoics are the only philosophers, and whenever he is combating Epicureanism his language is that of a Stoic. Some of Vergil's most eloquent passages seem to be inspired by Stoic speculation. Even Horace, despite his banter about the sage, in his serious moods borrows the language of the Stoics. It was they who inspired the highest flights of declamatory eloquence in Persius and Juvenal. Their moral philosophy affected the world through Roman law, the great masters of which were brought up under its influence. So all pervasive indeed was this moral philosophy of the Stoics that it was read by the Jews of Alexandria into Moses under the veil of allegory and was declared to be the inner meaning of the Hebrew Scriptures. If the Stoics then did not add much to the body of Philosophy, they did a great work in popularising it and bringing it to bear upon life.An intense practicality was a mark of the later Greek philosophy. This was common to Stoicism with its rival Epicureanism. Both regarded philosophy as 'the art of life,' though they differed in their conception of what that art should be. Widely as the two schools were opposed to one another, they had also other features in common. Both were children of an age in which the free city had given way to monarchies, and personal had taken the place of corporate life. The question of happiness is no longer, as with Aristotle, and still more with Plato, one for the state, but for the individual. In both schools the speculative interest was feeble from the first, and tended to become feebler as time went on. Both were new departures from pre-existent schools. 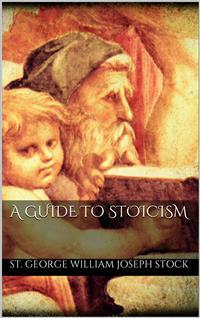 Stoicism was bred out of Cynicism, as Epicureanism out of Cyrenaicism. Both were content to fall back for their physics upon the pre-Socratic schools, the one adopting the firm philosophy of Heraclitus, the other the atomic theory of Democritus. Both were in strong reaction against the abstractions of Plato and Aristotle, and would tolerate nothing but concrete reality. The Stoics were quite as materialistic in their own way as the Epicureans. With regard indeed to the nature of the highest god we may, with Senaca represent the difference between the two schools as a question of the senses against the intellect, but we shall see presently that the Stoics regarded the intellect itself as being a kind of body.The Greeks were all agreed that there was an end or aim of life, and that it was to be called 'happiness,' but at that point their agreement ended. As to the nature of happiness there was the utmost variety of opinion. Democritus had made it consist in mental serenity, Anaxagoras in speculation, Socrates in wisdom, Aristotle in the practise of virtue with some amount of favour from fortune, Aristippus simply in pleasure. These were opinions of the philosophers. But, besides these, there were the opinions of ordinary men, as shown by their lives rather than by their language. Zeno's contribution to thought on the subject does not at first sight appear illuminating. He said that the end was 'to live consistently,' the implication doubtless being that no life but the passionless life of reason could ultimately be consistent with itself. Cleanthes, his immediate successor in the school, is credited with having added the words 'with nature,' thus completing the well-known Stoic formula that the end is 'to live consistently with nature. 'It was assumed by the Greeks that the ways of nature were 'the ways of pleasantness,' and that 'all her paths' were 'peace.' This may seem to us a startling assumption, but that is because we do not mean by 'nature' the same thing as they did. We connect the term with the origin of a thing, they connected it rather with the end; by the 'natural state' we mean a state of savagery, they meant the highest civilization; we mean by a thing's nature what it is or has been, they meant what it ought to become under the most favourable conditions; not the sour crab, but the mellow glory of the Hesperides worthy to be guarded by a sleepless dragon, was to the Greeks the natural apple. Hence we find Aristotle maintaining that the State is a natural product, because it is evolved out of social relations which exist by nature. Nature indeed was a highly ambiguous term to the Greeks no less than to ourselves, but in the sense with which we are now concerned, the nature of anything was defined by the Peripatetics as 'the end of its becoming.' Another definition of theirs puts the matter still more clearly. 'What each thing is when its growth has been completed, that we declare to be the nature of each thing'.